HTC cracks me up. Because they are fighting for their lives, they’ll say anything at this point to try and win you over. Whether that’s by claiming to reinvent the smartphone or by attempting to re-create the camera with the “UltraPixel” or calling out Samsung for pushing out a couple of gimmicks instead of innovating , they want to be loud and in-your-face. Let’s be clear though – there isn’t anything wrong with a little trash talking, but if we’re being brutally honest here, HTC is guilty of just as many gimmicks as Samsung. And that includes their new HTC One (M8), which may contain the mother of all gimmicks. For reference, during HTC’s unveiling of the One (M8) last week, their president of Americas (Jason Mackenzie) stood on stage all broseph’d up, and told us all how they aren’t into just adding a few dimples to the back of a phone, tossing in a software gimmick here or there, or blasting out the word with billions of dollars through marketing channels. No, instead they are about tossing in a few rounded corners to last year’s design, slashing features from their same panned 4MP camera technology in favor of a couple of software gimmicks, and then hiring celebrities that tell you to “ask the internet.” Spin it however you want, HTC, you did the exact same thing that Samsung just did, maybe even worse. I’d argue that the camera in the new HTC One (M8) is a bigger gimmick than anything Samsung did. I say that because things like Samsung’s heart rate monitor are indeed gimmicks, except they aren’t gimmicks that could potential ruin a major feature in your phone (the camera). 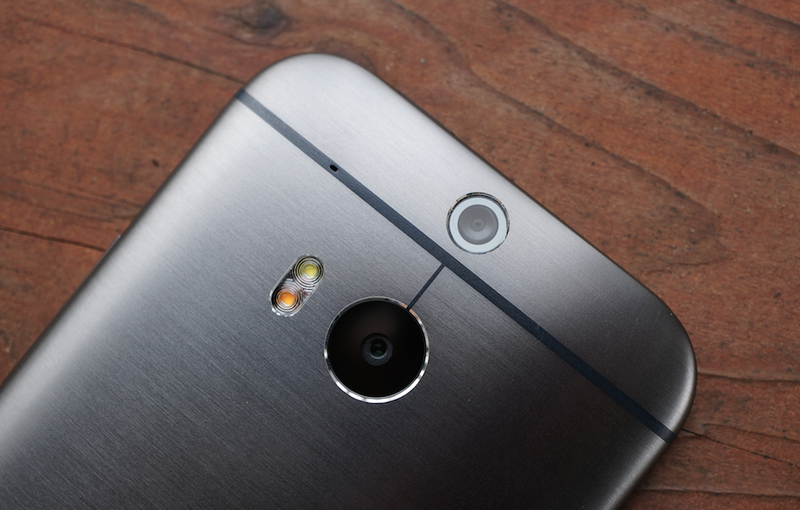 What HTC has done to the camera on the One (M8) could potentially do that for many users. At 4MP (or “UltraPixel if we’re being fancy), HTC gave us a camera that takes photos with a resolution smaller than the resolution on a 15-inch Macbook Pro with retina display. It’s also just barely bigger than the resolution on my iMac. In other words, good luck cropping, editing, zooming, or displaying your photos anywhere outside of Instagram or Facebook or your phone. Even photographers who received the device earlier than anyone had a problem with it. Beyond the low resolution, HTC also took away optical image stabilization (OIS) in favor of a 2nd camera sensor that is used for depth and creating 3D-like images. First of all, killing OIS instantly affects low-light shots and video steadiness. Are those two areas you would be willing to see a decline in? Second, those two were gimped so that you could re-focus photos after the fact to add bokeh (UFocus) or a wobblying 3D-thing (3D Dimension). The UFocus feature is implemented horribly, but is also something that Samsung and Sony have accomplished as well (if not better) with a single camera that also isn’t at a horrifyingly low 4MP resolution. The 3D Dimension feature should probably never be used by anyone. It doesn’t offer a 3D effect, it just blurs and distorts whatever image you are looking at. It’s terrible. In the end, what I’m trying to say is that everyone is doing gimmicks because innovation has slowed. But if you are going to do gimmicks, at least make sure your gimmicks aren’t killing off features or offering a sub-standard experience. While the HTC One (M8) is designed and crafted beautifully, there is one major gimmick that could ultimately be its downfall.